WIRASTAR Ice Cube Machine CV1000 series Ice Cube Machine has firstly adopted the three leading technologies: adjustable ice thickness, automatic water supplying, automatic ice freezing and ice falling. It is an edible ice cube machine, and has completely solved the problems of uneven ice thickness and ice falling difficulties, which are caused by changing ambient temperature and water pressure gap. With the combination use of flat-plate heat exchange technology and hot gas circulating defrost technology, it has greatly improved the ice cube machine’s capacity, energy consumption and performance stability. 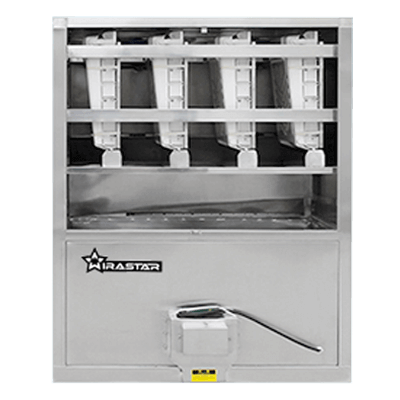 WIRASTAR CV series Ice Cube Machine adopts the modern design, integrated machinery unit, famous components, PLC automatic control, and food-grade stainless steel 304 material, which can meet the sanitary production standard.